Loved this class. Jon took us from one pose into another in a gentle way, melting from one pose to another. Highly recommended for the beginner or occasional yogi. Sunday Morning Group Hatha Yoga by Johnathan. Location Opposite of Ngiu Chap Wong KK Beef Noodles Plaza Damas Block L, 2nd floor. superb, as always. very patient instructor who provides great guidance. great tips from chris . will definitely come back should I return from overseas . enjoyed the class truly. Another awesome class today. Love it! there were some challenging poses but it was a good challenge to push myself further. We had a visiting yoga instructor (Julee) teaching Thursday class and it was real fun! This class was definitely medium level as stated and was a good challenge. Feels Great 🤗 Worth the sweat! Instructor is very helpful and goes around checking on all individuals. He focuses on technique and breathing too. Best suited for those who have practised yoga before. 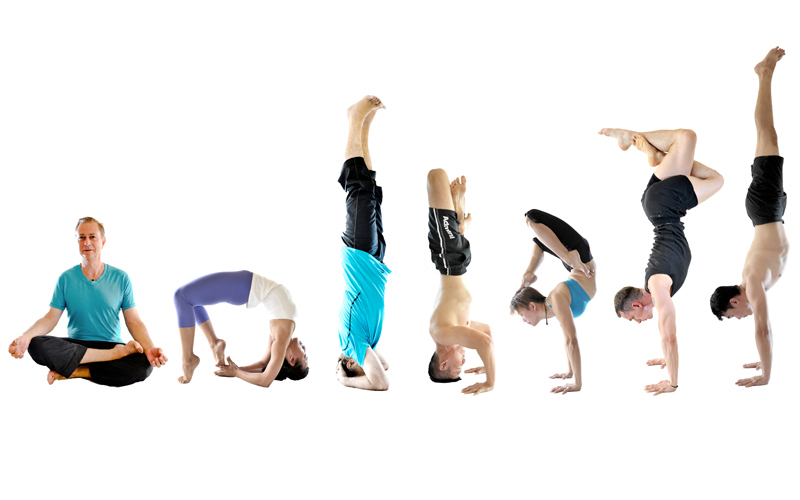 Matthew is a star in the yogaword. he gracefully guiedes us.the advanced level of the students helps to go beyond limits.wonderful! Clear and step by step instructions. Peaceful and clean environment. Chris class is always an amazing experience. Fantastic! The class was small so the instructor was able to give us enough individual attention. Fun class! Love Phil and his class! good for basic yoga or if u want to stretch til Kingdom come! Christy is very patience with a beginner like me! like it! Hatha 1 - intense stretching while using core to stay stable in the asanas. Very good! Jon is patient, clear and always provides suitable options for all practioners. April Kuan is a great instructor! Good coach and she is beautiful. I always enjoy Jon's classes :) Good way to start the morning! Experienced a new instructor he was very attentive to each person. Focused more on the legs enjoyed it Very much! very fun but super hard!! work that body! the instructors were super attentive which made me like doing for this class more!! I dropped in late due to road mishaps holding back traffic and Phil was accommodating to place me in the next class. April is a superb instructor as always. First time at aerial yoga. Very helpful and patient instructors! Will visit again definitely. Spine and back feels nice and relieved. I always enjoy Chris' flow class because he modifies the flow to work and stretch different parts of your body every time! Today's class was on alignment it was difficult but great work-out! Great flow class by Robyn, sweat buckets! Picked up lots of great tips on arm balance as well. Will return. Robyn's class is awesome. The pace is just right for me..
Great class and was assisted every step of the way. Good work out and stretching. first timer but well taught. challenging but really can relax body during flyoga class!instructor veey nice and patient! Fantastic for beginners. Was told this is more relaxing but that was exactly what I needed. Awesome experience in Flyoga. It's quite challenging yet fun. Required a lot of strength, flexibility, and balance. Just make sure u park near Block L as it's quite confusing for the first time visitor. Johnathan was amazing...best session I ever had. Hatha Yoga 1 - slow paced yoga, overall good if you just wanna do some light stretching exercises. Very good trainer. Very enjoy the class. Very fun class. Chris was very attentive and friendly. I love Chris. His voice is really soothing and his instructions were really good, easy for a first timer like me to understand. Facility was clean and well ventilated. I would definitely come again but maybe after a few normal yoga classes first as I am still not able to properly balance my body and consciously put appropriate amount of force/ pressure on my body when I'm on the "silk". the sequence today was a really nice flow and again, Robyn did a great job of correcting my pose and pay attention to everyone :) love the playlist she had going on and of course the ending series with the mini massage paired with essential oil. nice touch! thank you Jon. great class. arms are gonna be so sore tomorrow! Helpful and attentive instructors. Fun and interactive session! Nice place, a bit tricky to locate without directions, drinking water provided, a bit warm and ventilation required. flyyoga was ridiculously fun!! And a great workout too. This is a challenging class with inversions. Matthew is a great instructor and I liked the class very much. Vinyasa on Friday was more like a Hatha class. The teacher was very informative and gave clear instructions. Great class for beginner but still able to some free aerial poses!! Like it! absolutely my top hobby now. Although i would prefer If the studio had mirrors so that we can see ourselves n correct our poses, and a non-see through partition to the other class that can be distracting. overall, great instructors and clean studio. i love the flyoga class here. Learnt lots of tricks even for a day. Chris is great. Best so far. Great after a hard day at work. This class is just great to align your body! ggood instructor but intermediate/advanced difficulty. Deeply relaxed and great guidance! Getting the hang of it! Thank you, namaste! Really gets you in balance and off the ground! good class! Enjoy the aerial sequences more than the grounded ones. But overall a pleasant class. Today's session was good and somehow felt bit different routine. The class was quite full. So do come early and book a good position. It was a really scary experience (hanging upside down mid air for 5 minutes) for me but the helpers and teacher was very supportive! Went back after weeks of not going for yoga must say it was very challenging but good to be back. Lovely session today. Superb! Lovely and nice instructor! A tough class for a beginner, but it's a good challenge. Good to be back after a 1 1/2 months of being away. The stretching was so intense this time. But in a positive point. Thanks for a great session. Chris is a great instructor. Flyoga offers me a different type of challenge than regular yoga. The class was relaxed, casual and friendly, and I enjoyed it. It was challenging enough to inspire, yet not too challenging as to be discouraging. Love the class. The instructor is very good. Would be very helpful if you practise yoga before. had a great time. the instructor was patient and encouraging. Enjoyed this class. The instructor was very attentive to a newbie like me as he took time to correct my poses. Always a great class w Chris. He has a way of encouraging you to push yourself! Jane's hot hatha class was super nice, highly recommended for beginners. She is attentive, encouraging and always smiling. The infrared panels generate just the right amount of heat, which also means better airflow in the studio. Challenging class. Instructor has an interesting sing-songy way of speaking. Clean studio & facilities. Parking a bit pricey. Chris the instructor is exceptionally nice and patient with beginners! It's not as easy as it looks and if it weren't for some motion sickness it would've been an awesome work out! Flyoga was interesting. Better for those who can handle being upside down and off the floor. Fun, but not for complete beginners. Must have some yoga experience to practice this safely. I like Chris. He has a sense of humour with a serious face on. He tried different variation of poses. We did a lot of vertigo pose this class, but was fun overall. Had an Absolutely amazing time in this class! Chris is a good yoga instructor! Challenge is always an opportunity to grow!! Loved it!! Chris is very patience... enjoyed the class. Challenging, but plenty of fun for those who have a little bit of experience around the silk. Chris was wonderful and really took the time to go through each pose and helped new students to get it right. Had a great time learning something new. stretched a lot. great work out. good exercise for the back. loved it! amazing class by robyn. she is one of the most intuitive instructors around. Awesome experience. Very nice staff and definitely a different practice to be back to. Chris class is da best! Johnathan is one of the best yoga instructors I've come across on kfit. big thumbs up for this studio! Flyoga was not easy but super super fun! It was so good to be working after a long week! Good stretching this session. Sunday Hatha yoga. Multilevel yoga practice. Great experience. Chris was patient and didn't rush into the moves. Will definitely come back again. Went for Saturday morning's Hatha Yoga class with Jonathan and he was great - really took his time to ensure that everyone did their poses right. Would definitely attend again! Jonathan was a very patient and knowledgable instructor. Perfect way to start a Sunday morning! Super sweaty and seriously more heart pumping that I thought! Super fun! Hope Aravind Yoga Studio will open up more than 2 times for visit ! Totally have fun there. the best flyoga instructor in town! Got a little bit of motion sickness after doing this class. But it was fun nevertheless. Lovely session after CNY break. Great stretches and work-out. The class is good. Heather is great But someone brought her little girl who's running around the class - not good! Attentive instructor and good studio. Great Iyengar class by guest instructor, Parveen. For experienced practitioners. Poses were advanced. Instructor is very good and guide well.Having fun times there. Jonathan is a good teacher. Power Yoga wasn't easy - definitely a good workout for core and upper body! Iyengar yoga with Dawn. Not for complete beginners or those new to yoga. Instructor got the class timing wrong - came in 20min later. Best to call the studio first to double check the timing! Aerial Yoga with Chris is the best. Could do with new mats. Awesome class ! Swear a bucket. Will be back next week! enjoy goin to Saturday class nowadays. learn so much and love every new move Chris taught. so fun!! would love to give more than 5 stars. Tue 7.45pm class. 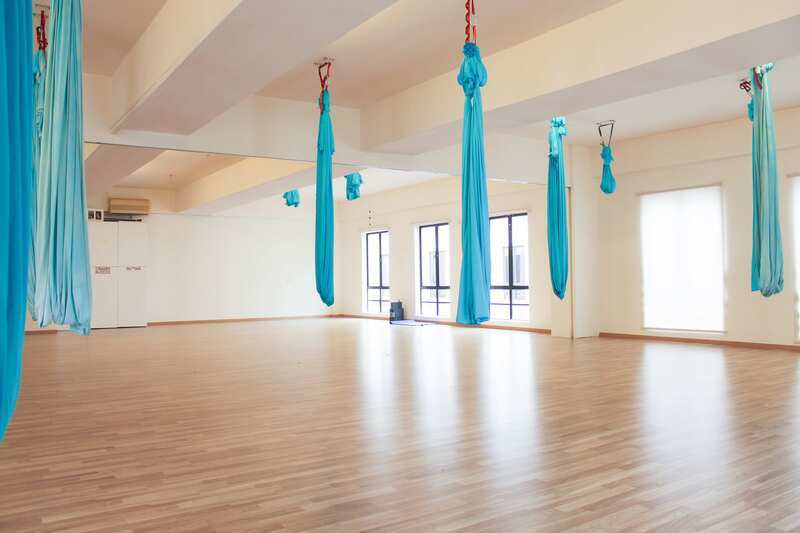 It's called Aerial Yoga, but there was nothing yoga about it; it was more like Aerial Silks class at Viva Vertical. It says Beginner Level, but it's not. 90% was funky intermediate stuff. Instructor didn't ask about injuries or experience; and beginner options were offered for only a few poses. One of the studio's seasoned yoga instructors joined the class, and even he was struggling! Join at your own risk! Challenging class but encouraging teacher. appreciate that he airs the studio and turn up the fans. Went for vinyasa yoga(i-a). Today class is awesome.1st time experienced using chair for yoga. Chris is very good instructor.i like the way he correct the post and encourage yogis to do any posses. Clear guide with good, deep flow! Good class. Instructor was very gentle and attentive. Will come again. Jane is so attentive to new students, enjoyed the class! the instructor was great and attentive. as there were several beginners in the class, she went around to make sure they could go in and out of the moves safely. Tuesday 7.45pm Aerial Yoga class. Interesting challenging class for those who have been practicing for some time. the instructor demonstrates the steps before guiding the class, giving us tips on the correct form and posture. the more experienced students are helpful as well, and the atmosphere is light hearted and fun; a good way to distress and stretch out all the tensions after work. 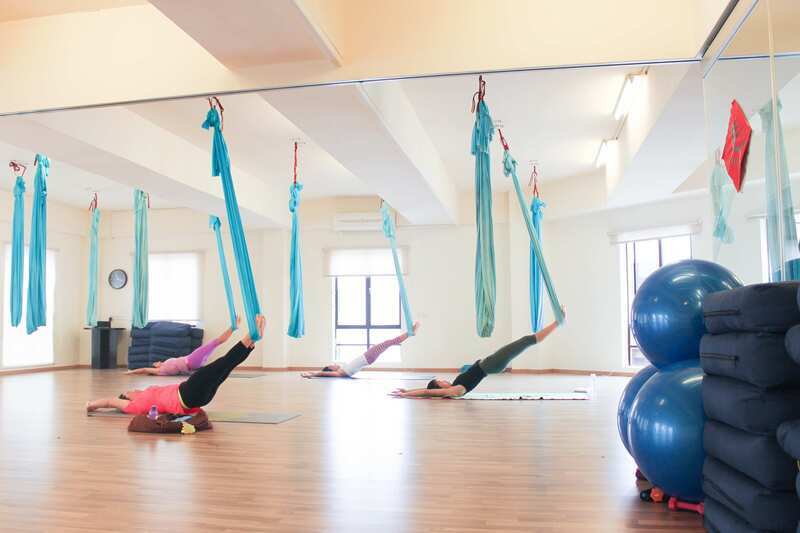 I wish they would list more Aerial Yoga classes and include them in the kFit Fitness Pass though; seemed like some classes which we previously included in the pass and not included anymore :( it is a really popular class and a fun exercise. A good new experience :) Teacher is experienced. Enjoyed the hot yoga class and sweat a lot. Good and relaxing class. Remember to bring your own mat. 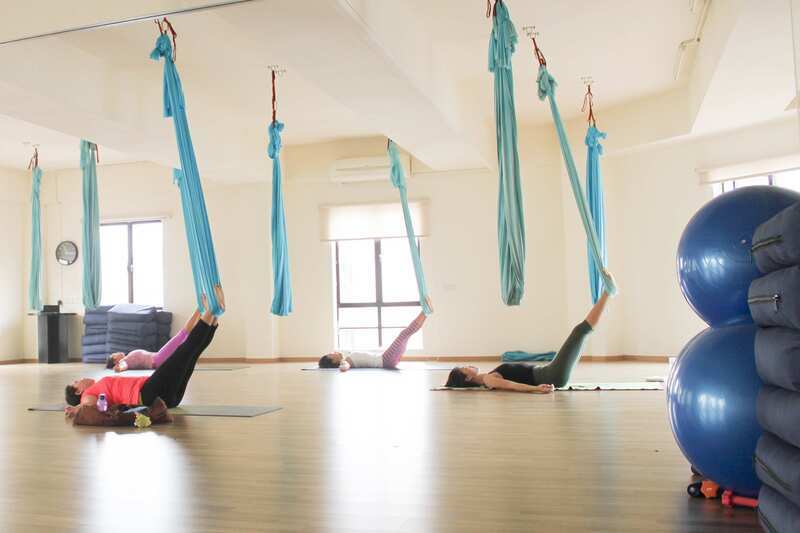 went to the sunday aerial yoga for beginner. the coach is friendly and patient. gald that they keep the size of the class small (only 8 of us) so she can give attention to eveyone of us. Amy, was awesomely a great instructor. Was intense yet fun class! The basic hot yoga class was so nice and calming. Love the instructor Mimi - she makes the class so much more enjoyable. Very slow. At least I know this yoga style is not for me. It’s abit tough for a beginner like me. But it’s kinda fun. Liked the session so much! Good morning session with Jonathan. 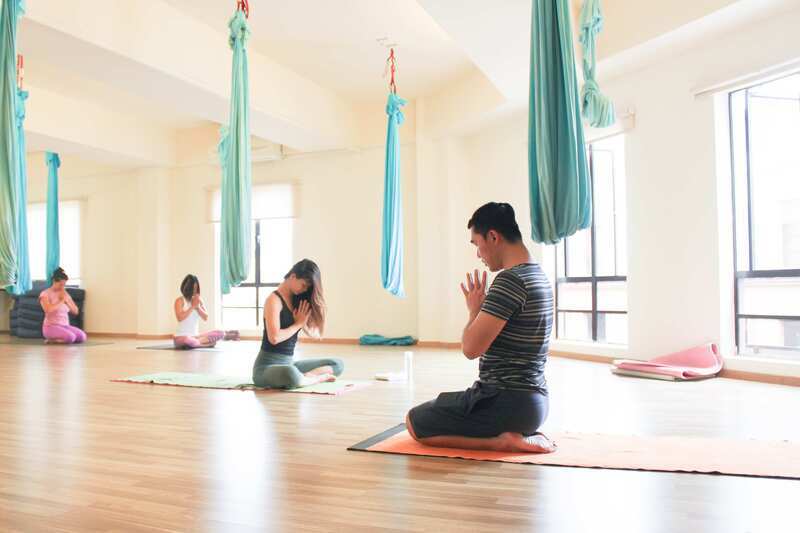 Aravind Yoga Studio is a home studio with a cosy setting, located in Jalan Sri Hartamas 1. Their team of instructors are all very experienced and qualified instructors who are definitely friendly and warm to all students. They emphasize a lot on Breath Alignment, Strength, and Balance, for the sake of bringing Harmony into your practice, and eventually, your life. 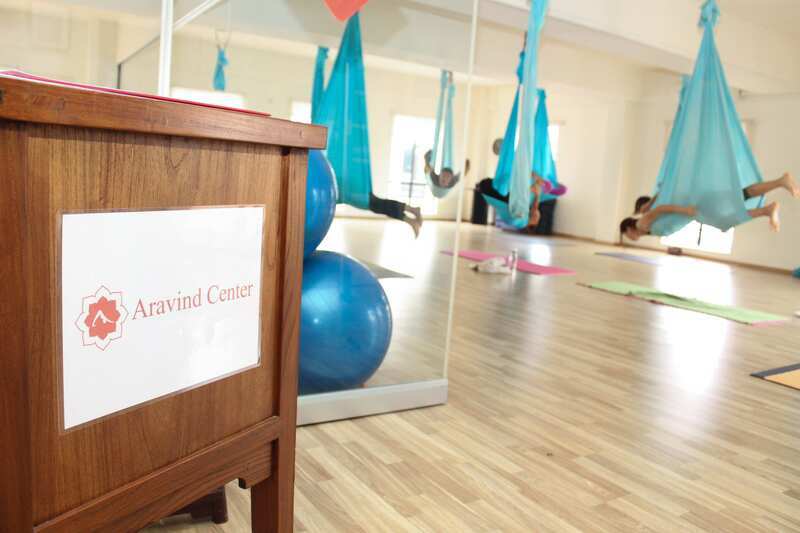 Aravind Yoga Studio's classes cater to varying levels, and they also covers different activities, namely Wellness Medical Qigong, Flyoga, and Yoga of various approaches.